I would not consider myself a confident driver, but I haven’t always been this way. As a kid, I drove my four wheeler all over my grandparents’ farm without a second thought. Even rolling my dad’s three-wheeler down into a creek bed and burning myself pretty badly didn’t temper my love for going fast jumping terraces. And I don’t recall a real lack of confidence when learning to drive a car at 14, either. I remember a feeling of pride when I successfully turned my truck around on top of a levy during a lesson with my stepdad. I think learning to drive in a lifted truck with big tires made the rest of driving easy. I’m pretty sure I can trace my driving anxiety back to wrecking my mom’s car when I was 16, with my two young siblings in it. Thankfully, we all walked away with little more than a few stitches for one of them and some nasty airbag burn for myself. But 14 years later, you can still see the indention where our car hit the embankment. I think it took about a month for me to get behind the wheel again, but I don’t remember any further anxiety about driving until I had kids of my own. Then it really hit. It’s never kept me from driving, but I’ve always been overly cautious, and more than willing to let anyone else drive so I didn’t have to. In fact, I had developed a pretty deep anxiety of driving with another adult in the car, even my husband. But here’s the thing…even with the driving anxiety, I still have always loved cars. I loved attending the KC Auto Show each year, and just ask anyone who’s ever had to listen to me talk about my first truck (it was a 94’ Chevy Cheyenne with a 4-inch lift and I loved that thing). I equally admire classic cars and the tech-heavy newer generation. I just wasn’t confident driving them around other people. So how do you think I felt when A Girls Guide to Cars invited me out to experience the BMW Performance Center in California? Equally giddy and nervous as all hell. I might have even daydreamed about excusing myself from driving to just capture more photos/videos. But in the end, I did it, and I’d say it has been the biggest catalyst in giving me back my confidence behind the wheel. 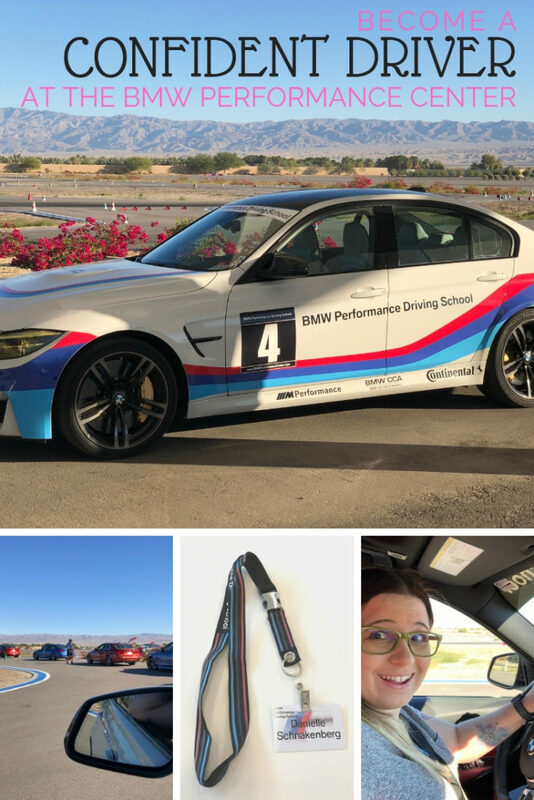 Before I get into my experience, I want to preface this with saying that our experience at BMW doesn’t directly align with any of their packages, but I would recommend the BMW Track Meet experience and M-Track packages to come pretty close to what we did. Our day started with a nice little breakfast and then classroom-style instructor session where we learned about the physics of cornering, and why we’ve all been positioning our seats wrong, among other things. My group started with timed laps in the M3, and since we started with an odd number in our group, I volunteered to be the one without a partner. My driving anxiety liked the idea of not having anyone else in my car to judge me. But the end of this session, I regretted that decision. I had a ton of fun and definitely gained some confidence, but after watching the other pairs push each other to better-timed laps by the excitement and cheering of their partners, I knew I missed out on a key aspect of the exercise. Once we completed the instructional lap, we got a couple of timed practice laps in, and then it was a full-out competition, with each driver getting three laps. My time did improve from practice to official laps, but my three official laps were all pretty close. While others in my group were super competitive, I decided that I was only competing against myself, and not even to better my times, but just to push past my anxiety and do the darned thing. There was one tight curve on the back of this track that gave me trouble. What I realized afterward was that on these tracks, you throw away everything you use in day to day driving. You know all of those times your mom told you to stop breaking so hard? It’s the opposite here. I kept feeling bad that I was squealing the tires on that curve, and it was majorly slowing me down. Had I just gotten over that, my times might have actually been competitive! But what matters is that I got out there, I did it, AND I HAD FUN. Timed laps were all about learning to corner correctly (breaking before the curve, accelerating as you hit the apex) and really getting used to breaking hard to land your car in the box at the end for your time to count. It wasn’t really about high speeds—I don’t think anyone got above 60mph on that session (I could be wrong, I didn’t focus on speeds there). The M-Track is all about speed. This session is done follow-the-leader style, and we broke down into smaller groups for this one. I gained a driving partner for this one, and our group was just the instructor and two student cars. You get out on the big track, do one reconnaissance lap (learn the track), one acclimation lap (get used to driving at speeds faster than the interstate), and then a couple of fast-paced laps. My partner insisted I go first, and we happened to be the lead car behind the instructor. This was one of the best driving experiences of my life. My drive partner ended up rushing out of the car to empty her stomach when we came back to pit (but I don’t think that was my fault—quite a few people had that reaction to the curves and g-forces on the track). I had the option to take her turn since she wasn’t up to it, but my anxiety was coming back a bit, so I let one of the other ladies in my group behind the wheel. Part of me wishes I hadn’t done that, another round on the track probably would have done wonders for my confidence. But, I will say, that I got the most amazing video of Kim-Marie driving, so it’s a win in the end. After the speed on the M-Track, I will say that the last session was sort of a let down. It was still fun, just not quite as much fun. On a smaller version of the track we used for timed laps, we played switcheroo through a variety of BMW models, including a couple of their SUVs. Each driver took a couple of laps, back to pit, switch driver, take a couple of laps, back to pit, move forward a car, rinse and repeat. Despite this being the lowest speed session of the day, I’d say it’s where our group had the most snafus. I managed to get out onto the track in manual mode somehow (which they don’t want you in, and I hadn’t quite figured out), and another car in our group actually managed to skid off the track at one point. No one was hurt, including the car, and at the end of the day, that driver was joking awarded the “Dora the Explorer Award” for exploring where no one had before. All in all, it was a great way to experience a variety of the BMW lineup and compare them. I absolutely fell in love with the M5 but learned I’m not a huge fan of their SUVs. I would note that if you do a session like this, try to make sure your drive partner is similar in height to you. Mine was not and we spent a crazy amount of time adjusting seats, and that might have impacted how I felt about some of the cars if I didn’t have the time to get it 100% right. It’s certainly not a replacement for a proper test drive! We wrapped up the BMW drive experience by going out on Hot Laps, driven by instructors. If you’ve never experienced drifting, it’s a fun ride! And it was fun to watch from the sidelines, as well. We ended the day with a little awards ceremony where they tallied up the timed laps from all three groups and announced the top three. And of course we were sent home with a little swag, including the special hats that can only be owned by completing one of their drive programs. I really didn’t think my lack of confidence behind the wheel and overall driving anxiety would make this a pleasurable experience, but I’m glad I went with my life motto “So What?! Do it scared!” And did it anyway. 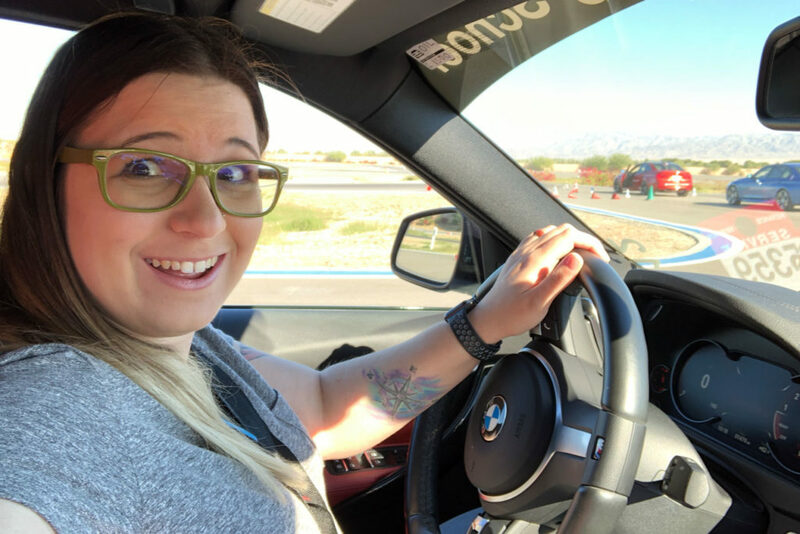 I came away with an absolute confidence boost behind the wheel and, surprisingly, some applicable tips for everyday driving. Learning how to properly handle curves, adjust your seat, and set yourself up for full control of your car applies to everyday driving every bit as much as it does on the track. If you have a chance to head out to the BMW Performance Center, I’d highly recommend it. They have everything from one-hour driving experiences (like the M-Track) to multi-day schools. They even have a basic driving school and teen driving school if you or your teen could use some time with an instructor. 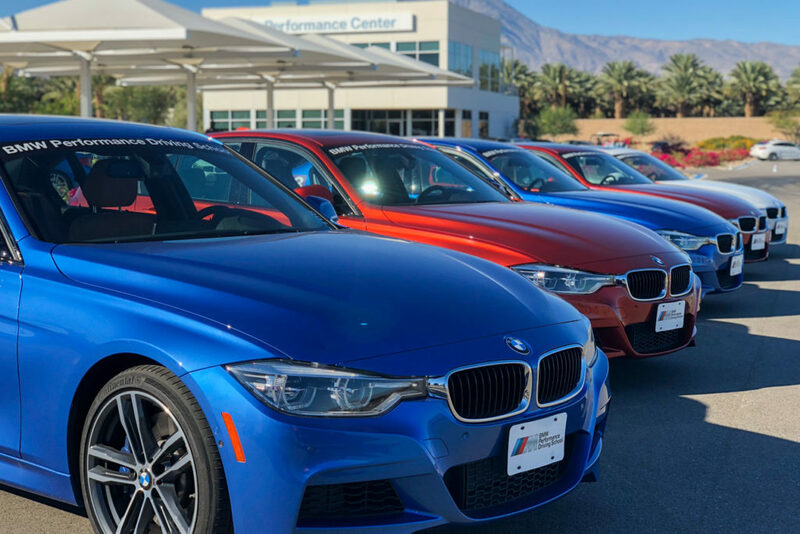 Want to win your own BMW Performance Center Experience?